This post is the first in a series looking at The Shape of Practical Theology by Trinitarian theologian Ray S. Anderson. For additional posts in this ongoing series, click a number: 2, 3, 4, 5, 6, 7, 8, 9, 10. 11, 12, 13, 14, 15. It's not uncommon for people to complain that theology is too theoretical to be of practical value (or, as some say, "so heavenly minded as to be of no earthly value"). I understand the frustration. When a person first wrestles with the stunning reality of who Jesus is (the proper focus of truly Christian theology), they are lifted up by the Spirit into the "heavenly realms" where the "view" can seem, at least at first, disconnected from earthly realities. However, some struggle is predictable (even necessary). Wrapping one's mind around the glorious mysteries of the triune God who is revealed in Jesus Christ is no small task. But it's a vital and rewarding one. If you find your study of theology a bit overwhelming, I urge you to persevere. As you do, I believe you will, by God's grace, discover that the Incarnational Trinitarian theology discussed in this blog is highly practical, for it deals with ultimate realities (both heavenly and earthly), brought together and made comprehensible in Jesus. As both divine and human (one being, two natures), Jesus is one with the Father and the Spirit (in the Trinity) and one with humanity (through the Incarnation). In the person and work of Jesus there is no dualism---no separation between the heavenly (spiritual) and earthly (physical). Though this theology necessarily involves theory, when rightly understood, and applied, it is highly practical. ...laid the groundwork for a praxis-oriented theology through an ethic of discipleship and obedience, where theory emerges only through engagement with truth as an ethical demand in the form of the claim of Christ through the other person (pp. 17-18, emphasis added). 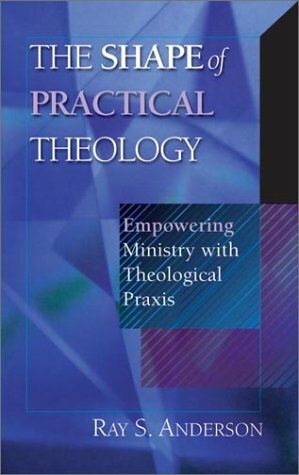 It is characteristic of Incarnational Trinitarian theology that theory follows (and is informed by), ministry praxis. This sequence is key to Anderson's argument, and, I might add, key in my growth in understanding this theology. Before I came to understand the theory, I encountered its reality in the practice of Christ-centered, grace-based ministry. My experience (like Bonhoeffer's) was something akin to that of Jesus' first disciples. Jesus did not begin discipling them with lectures on theological theory. Instead, he said, "Follow me!" As they "tagged along" with Jesus as he ministered in the community, the reality of who Jesus was began to emerge. If was only through years of reflection on this encounter with the person and work of Jesus that they came to understand the theology that under-girded (and validated) their experience. In that sense, mission/ministry praxis proceeded (and then informed) theology. Note also that the disciples' encounter with Jesus was in community. As Anderson notes, "...truth must be experienced to be believed, and it is in the church that the truth of the gospel is to be lived out." Also note that the relationship between theory and practice, rather than being linear (as in theory first, then practice next), is highly interactive. "Theory and practice inform and influence each other in such a way that all practice includes theory, and theory can only be discerned through practice" (p. 21). One sees this clearly in a careful reading of the four Gospels, where we not only hear Jesus' words, but see his practical actions (works). As Anderson notes, it might be better for us if Jesus' actions were highlighted with red type, rather than Jesus' words. Practical theology is a dynamic process of reflective, critical inquiry into the praxis of the church in the world and God's purposes for humanity, carried out in the light of Christian Scripture and tradition, and in critical dialog with other sources of knowledge. As a theological discipline its primary purpose is to ensure that the church's public proclamations and praxis in the world faithfully reflect the nature and purpose of God's continuing mission to the world and in so doing authentically addresses the contemporary context into which the church seeks to minister (p. 22). It was the contemporary and present reality of Christ through the power of the Holy Spirit that stirred [Paul] to theological reflection.... Paul viewed the ministry of the Holy Spirit as the ministry of the risen and ascended Christ... It was the presence of the Holy Spirit in the lives of uncircumcised Gentile believers that... prompted Paul to declare that circumcision no longer should be a criterion of salvation through Jesus Christ (Galatians 5:6) (p. 30). The mission of the church is to embody in its corporate life and ministry the continuing messianic and incarnational nature of the Son of God through the indwelling of the Holy Spirit. The nature of the church is [thus] determined in its existence as the mission of God to the world (p. 31). The point is that practical theology unites theory and practice, doing away with any dualism that artificially separates the two in our thinking or practice. I want to emphasize this point, because, unfortunately, some who embrace Incarnational Trinitarian theology find themselves stepping aside from mission, feeling that it somehow contradicts the theology. I understand where these folks are coming from, and in fact, I'm sympathetic to this move since much of what is done by the church in the name of mission is not participation in what Jesus is actually doing. But let's not "throw the baby out with the bath water" either. Instead, let's embrace the incarnational Trinitarian perspective, which places mission at the heart of theology by uniting theology and practice in the one person of the God-man Jesus and in his ongoing ministry in the world, which through the Spirit is fulfilling the Father's mission. I'll write more on this topic in future posts, in the meantime, click here for an earlier post that explores Ray Anderson's incarnational Trinitarian theology.